Pres. 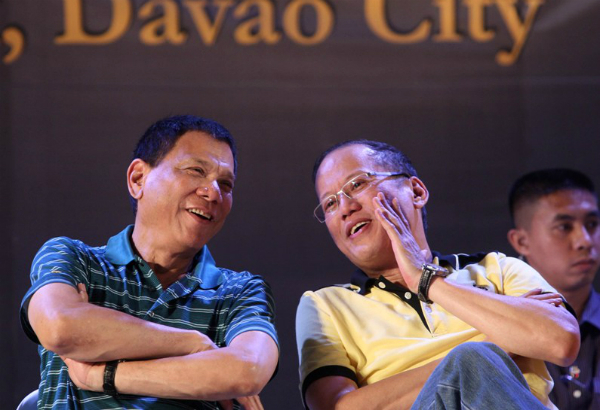 Aquino Communicates to Rivals to Merge to Stop Duterte Winning Presidency! On Friday, President Benigno Aquino III said he was making an action in efforts by his selected successor Manuel Roxas to work with other candidates and make an alliance to halt Davao City Mayor Rodrigo Duterte from winning this coming May 9 Philippine Election. He said that he consistently communicating to Roxas, Sen. Miriam Defensor Santiago, Vice President Jejomar Binay and Sen. Grace Poe has a vision to them combining forces to stop Davao City mayor's plan. According to CNN Philippines, Aquino said, "I am trying to get all of these different voices together and in that sense, perhaps help our candidate get together and have that united front." Prior to May 9's actual vote, the final major opinion poll showed Duterte's lead with 33 percent of respondents in favor of him based on the Social Weather Station (SWS) survey. The president is frightened that if Duterte wins, he might "do exactly what he intends to do." "Mayor Duterte has roughly 30 percent. That means he doesn't have the 70 percent. In our democratic system, it's the majority that decides. Therefore, it behooves everybody to try and get together," the president said pertaining to the latest SWS survey in case an alliance will happen. "Instead of thinking what should we do if everything he says is exactly what he intends to do, why don't we remove that threat or problem or insecurity by uniting the 70 and defeating the 30. The whole point is, any of two of them unites, if it's Mar or Grace that unite, we have more than 40 percent. That defeats the 30 percent." Aquino added as he is trying to combine the percentages to beat the 30 percent. "I'm trying to get all of the different voices of different sections together," he said as it may come up a more intact group.